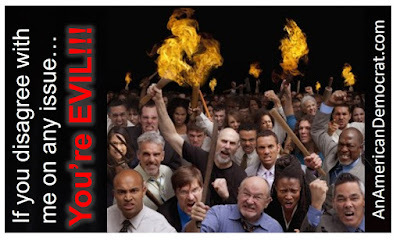 An American Democrat: If you disagree with me on any issue... You're EVIL! If you disagree with me on any issue... You're EVIL! If you disagree with me on any issue, no matter how sound your logic or profound the facts, you are a racist, white supremacist, misogynist, xenophobe, islamophobe, homophobe or something just has horrific. I am never wrong. - Progressive Liberal Democrat.